The CFA Ambassador Program will help exhibitors give a public face to the cat fancy and offers knowledge transfer from those of you who know to the interested public. You will see some of us wearing buttons that say ” Ask Me.” The buttons are to provide the public with a contact person. If we don’t have the answer, we will get it. Our Handbook is a wonderful tool for talking about CFA and their positions on many cat related subjects. If you’re exhibiting at a show and want to help the public learn about CFA and the pedigreed cat, understand how the rings work and what the cat show is about, etc., you may enroll in the CFA Ambassador Program to help. You will receive an identity button, a cage topper and a handbook so you can become totally familiar with answers to the most frequently asked questions at a cat show. The CFA Ambassador Program is a first-rate resource for those who are interested in helping people understand CFA. For more information CLICK HERE. Do you want to show and/or breed pedigreed cats? If so, then the CFA Mentor Program is the place to start! There is a lot to learn, and you will surely have many questions about things such as planning a cattery, selecting foundation breeding cats, raising kittens, grooming and nutrition. An experienced CFA mentor can offer guidance and advice to point you in the right direction and help you make good decisions along the way. Signing up for the Mentor Program is easy! All you need to do is complete the protégé application to be paired with one of our experienced mentors. You can also send an email to mentoring@cfa.org for more details. Check out the CFA NewBee Program HERE or send an email to info@cfanewbee.org for more information. YFEP -Youth Feline Education Program has divisions for youth from 7 to 18 years old, with age appropriate activities and opportunities. The program is not limited to breed presentations. Points can be earned by showing your cat in competition or HHP classes, giving a short talk about your cat, working as a steward in a ring, creating a health journal for your cat, helping at a no-kill shelter, working as a CFA Ambassador, and more. We want it to be fun while you learn about cats. The points you earn can qualify you for a regional and/or national award. The top YFEP participants will be awarded cash prizes at the CFA Annual Awards Banquet. YFEP is on social media! If you are a member of Facebook, please go to www.facebook.com/CFAYFEP and like us so you can keep up to date with your favorite youth. There, YFEP members can talk with each other and share their experiences. Check out the YFEP website HERE. You’ve all heard about dog agility competitions, and have thoroughly enjoyed watching the dogs whip through the obstacle courses with determination and speed. It’s amazing how they can climb up and down those high steps and race through those weave pole areas with such ease and speed. Now, can you actually imagine a cat lowering its dignity enough to do that? But, of course! Cats are definitely trainable and most are willing to follow a feather or dangling toy anywhere! Feline agility competitions are rapidly growing in popularity at cat shows around the world. CFA started planning agility competitions late in 2004 and numerous clubs have jumped at the chance to set up an agility course at their cat shows. Exhibitors are standing in line to put their cat through its paces. And spectators are just loving it! Agility is a pre-entered competition, open to any cat, so a household pet could be the overall winner as easily as could a top winning grand champion or perhaps a litter mate of a grand champion who does not do well in the conformation classes but is a star in the agility class. For more information CLICK HERE. Welcome to the Cat Fanciers’ Association New Bee Program. We’ve created this program to answer those questions that a new CFA exhibitor has! Perhaps not all of them, but as many as we possibly can. The program covers a variety of topics – from how to enter a show, how to get both you and your cat ready for the show, special travel considerations, and how to make the show a great experience for you and your cat. There is also a Yahoo Group just for “NewBees” – If you are a new exhibitor, we encourage you to join this group. Here you can ask questions about preparing for shows, what to expect at a show, or situations you may have experienced in the show hall. We have lots of experienced exhibitors in this group to help answer your questions. Plus you’ll also meet other new and not-so-new exhibitors and be able to share your experiences with them! For more information CLICK HERE. Breeders Assistance Program (BAP) – CFA has developed a program for owners of catteries who find themselves overwhelmed for various reasons. The program aims to help and support breeders, who find themselves in an out-of-control situation, by making assistance available through other breeders. Help and support will be provided upon request. The Breeder Assistance Program is able to help with advice, food, physical assistance, and placement of cats, if requested. IF YOU FIND YOURSELF IN ANY SITUATION WHERE HELP IS NEEDED, please email CFAAnimalWelfare@aol.com. All emails received will be treated with the utmost confidentiality. The Food Pantry is a project that started in the CFA Midwest Region because, as they moved forward with the Breeder Assistance Program, they discovered a need for pet food. Some people had lost their jobs and could no longer afford sufficient food; others had emergencies, such as a fire. The Food Pantry was developed to fulfill this need. With the generous assistance of Royal Canin, who donates their overstock to the Food Pantry, this program has now been elevated to operate on a national level. Royal Canin, and the Food Pantry, also donate large quantities of food to shelters and rescue groups. For more information on both programs CLICK HERE. The Midwest Region in CFA has encouraged the competitive showing of what we call Household Pets (HHP). These cats can be non-pedigreed, rescues, pedigrees in disallowed colors or with disqualifying traits – if it can’t be shown in one of the pedigreed cat classes, chances are it can be shown as a HHP! Many of our breeders and exhibitors bring along their own household favorites to show. Since the 2006 season, we have scored and given awards to the top HHP’s that are the equivalent of the Regional Winning pedigreed cats. In 2011 the CFA Board passed a resolution that allowed HHP’s to be registered in CFA, please click HERE for further details. This is a class about fun, beauty and personality, not perfection in meeting any standard. 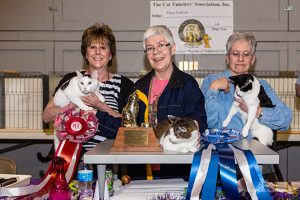 Some exhibitors choose to only exhibit at local shows; others will run their cats all year for one of the coveted Regional Awards. We seek to make this a fun, exciting and educational experience for anyone who is owned by a cat!